It was one of those Sundays where the consumption of calories seemed to be the primary goal. Chef Hot Pepper and I had already taken down the best black bean burritos in Santa Monica, CA at Holy Guacamole on Main Street. Still, there was something missing. 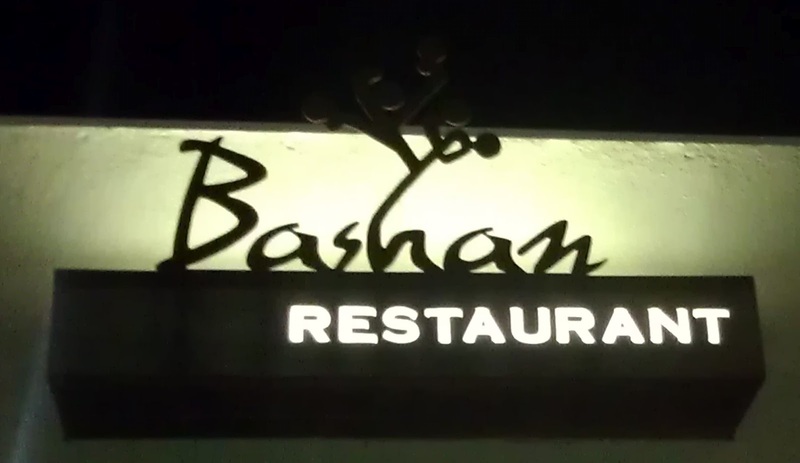 I had a Groupon for Bashan out in Glendale, CA. It turned out that Sunday night was burger night at Bashan. Chef Nadav Bashan was creating a limited number of high-end burgers on Sunday evenings. The 18 dollar price point was daunting, but the 2 for 1 $25 Groupon eased the sting. We made the 22 mile drive to Bashan to check out the much lauded gourmet burger. We were seated immediately (we had a reservation). We chatted with the server about the burger who pronounced it the best burger that she had ever tried. Our Bashan Gourmet Burgers were ready and in front of us in about 15 minutes. The Beef: The component cuts of beef in the Bashan cheeseburger were consistent with a gourmet/fine dining burger offering. 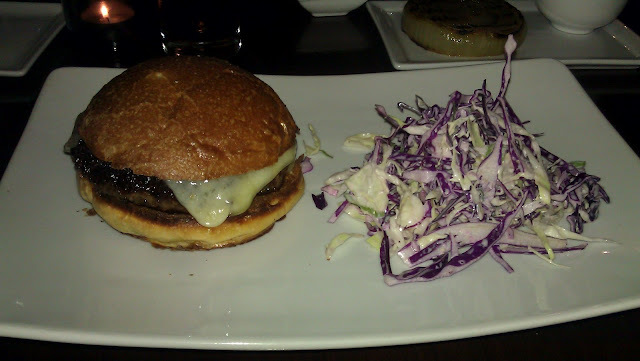 The burger was a blend of house-ground Filet and Short Rib. The Filet was a risky choice considering the relative blandness and an intense leanness of that cut of beef. This gamble paid off, though. The Filet provided body, a smooth, potent beefy flavor, and sumptuous mouth feel. The Short Rib provided just the right amount of gaminess and mineral notes. The 8-ounce burger was dripping with juices, and there was an abundance of blood, which was consistent with steak. The beef was not aged, and this absence was noted and missed a little. For 18 bucks, I felt that dry-aged beef would have been appropriate. The fat content was closing in on 25%, so the kitchen must have cut some fat back into the mix. An aged Sirloin fat (The West Branch, NY, NY) or deckle (The Brindle Room, NY, NY) would have added some additional complexity to this burger. Still, the beef was excellent...nearly perfect. The seared exterior provided a delightful counterpoint to the high-quality, flavorful, bloody Rare beef within the burger patty. The Seasoning: The exterior of the burger was seasoned with a subtle amount of salt. The light touch of salt was right on the mark, and it served to showcase the remarkable sear. The Sear: The Bashan kitchen applied an intense and interesting sear to the burger patties. The sear was quite good near the middle of the burger, but the sear was crisp, deep, and impressive around the full perimeter of the patty. This crisp and near-perfect sear provided a bacon-like crispness in nearly every bite. This spoke to some serious talent in the Bashan kitchen. I surmised that this delightful sear had been accomplished by allowing the burger patty to first cook in the pan to render off some of the copious fat. A high smoke point oil would have been added next to avoid creating a scorched flavor. Next, the pan would have been tilted 45 degrees to create a pool of hot oil. The edge of the burger would have been rotated with tongs through the hot pool of oil at the bottom of the slope. This would have accounted for both the crisp (fried) sear and the added depth of the sear along the edges of the patty. If this was the technique employed, then the Bashan kitchen was really putting time into each dish. The Preparation: The beef was ground and blended in-house. It appeared that the Filet was hand-chopped. This would have explained the short bits of steak in the burger and the amount of blood that was retained prior to cooking. The burgers were seared off in a blazing hot and well-seasoned cast-iron pan. The burgers were cooked to an actual and accurate Med-Rare. This was appropriate considering the quality of the beef delivered by the Premier Meat Company. I had previously encountered Premier Meat Company meats at LBS: A Burger Joint at the Red Rock Casino and at Holsteins at The Cosmopolitan, both in Las Vegas, NV. Both of these burgers were terrific. The Cheese: Bashan applied Gruyere cheese to the burger. The Gruyere was properly melted, and it was fine on its own.However, the cheese was simply lost in the sensory onslaught provided by the blood, the beef, and the sear. The Gruyere was along for the ride, but it didn't take a turn at the wheel, and it did not offer to chip in for gas. The cheese took a nap in the backseat. This burger required a potent, sharp, smokey cheese or none at all. The Bun: This was a basic, fresh, nicely toasted, sweet, yeasty brioche from La Brea Bakery. The bun was buttered, and this added to the general oiliness of the dish. The brioche did a competent job of delivering meat to face. It was also most adept at soaking up the copious juices that escaped the burger patty as it was compressed during the meal. The bun, like the cheese, was pretty much lost in the beefiness and crispness of the burger meat. The Meat To Bun Ratio: This was teetering on the edge of being meat-heavy. The bun barely held the burger and juices. With the aioli and the onion, the bun would have been overwhelmed. The Toppings: Meh. The garlic aioli was overly rich, and it lacked any acid to balance the overall richness of the dish. The MASSIVE roasted onion that topped Chef Hot Pepper's cheeseburger was semi-sweet, a little oily, and watery. The onion was quickly removed. The Bashan Gourmet Burger would have benefited greatly from a thick, cool slice of heirloom tomato and some crisp Bibb lettuce. The Sides: No fries, but there was a helping of red cabbage coleslaw. This too was lacking in acid. The slaw was lukewarm and rich. It seemed to be nothing more than julienned cabbage and house-made mayonnaise . The slaw bordered on unpleasant, and it was left virtually untouched. The Value: Bashan served up a burger for an unflinching $18. I chuckled when I noticed that for an extra $13, I could have added Foie Gras. Since I used a Groupon, the price was closer to $9. Including tip, I ended up paying $33 for 2 Bashan Gourmet Burgers and 2 soft drinks. That was about right. $18 for this burger was just too much considering the sides and toppings were poorly considered. The Bashan Gourmet Burger and the attendant toppings were a study in richness. The burger meat was delicious and expertly prepared, but the total dish was overly indulgent and unbalanced. We ended up stopping off at Baskin Robbins for some Daquiri Ice to cleanse our palate. 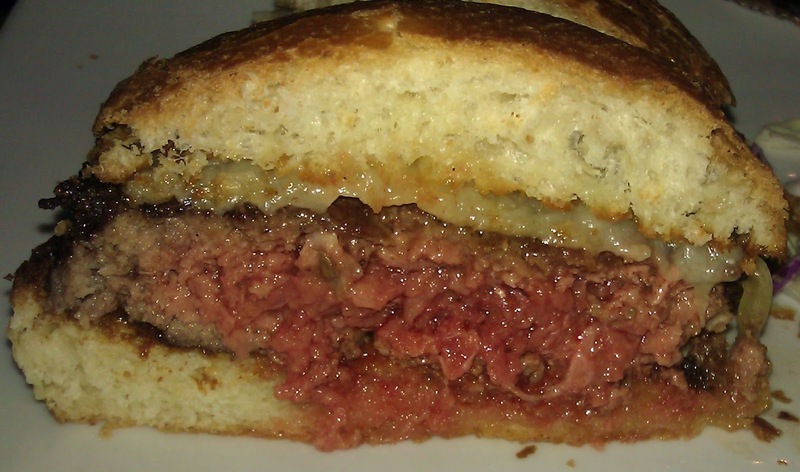 Burger Review : Bashan served up excellent beef, excellent preparation, and an amazing sear. If richness is your thing, then Bashan could be your thing.